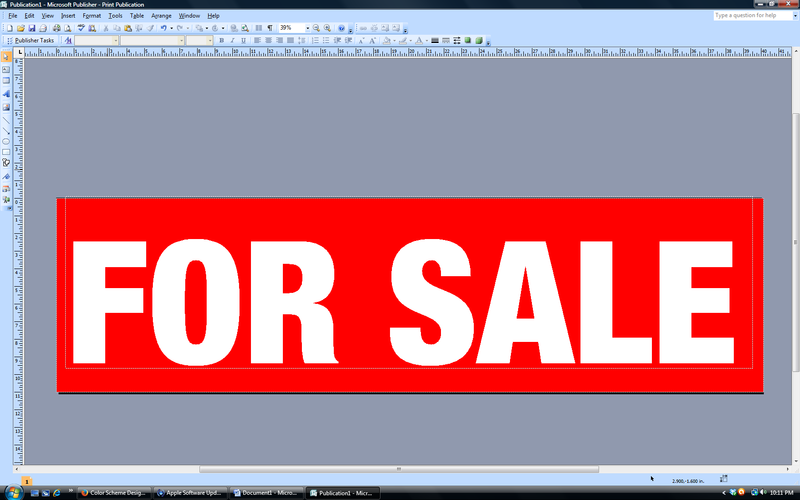 So You Want to Design Your Own Banner? We welcome guest blogger and graphic designer, Jenni James of Jenni James Design, to the Copy Talk blog to share a few tips with us non-designers who want to create a banner in-house. First things first. Do you remember what the acronym K.I.S.S. stands for? Keep It Simple Silly. This is the key for great, attention-grabbing banner design. I will go over three basic concepts, that if used correctly, will help you effectively convey your message to the viewer. Theses design concepts include fonts, color and proximity. Here we go! We have all seen signs or banners that use a crazy font preloaded in desktop publishing software, that you can honestly barely read. This is not a good idea. 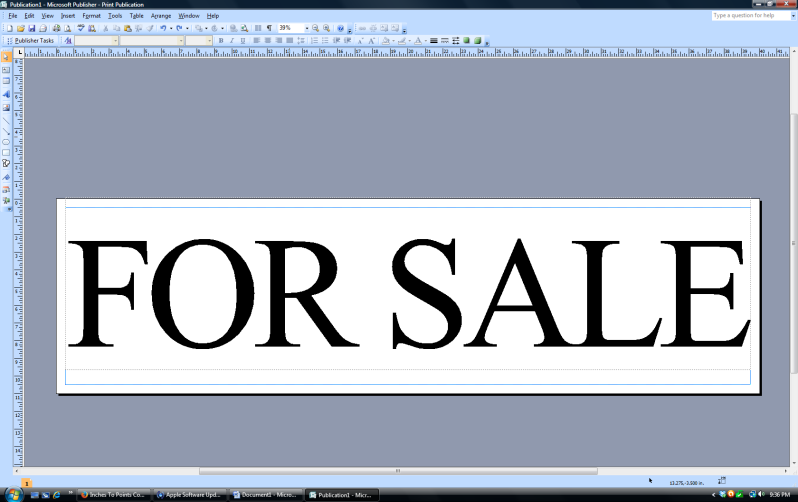 Yes, these fonts do have their place, but it usually is not on your banner. When it comes to banner design, you want to use a font that represents your message as well as looks nice and legible from a distance. 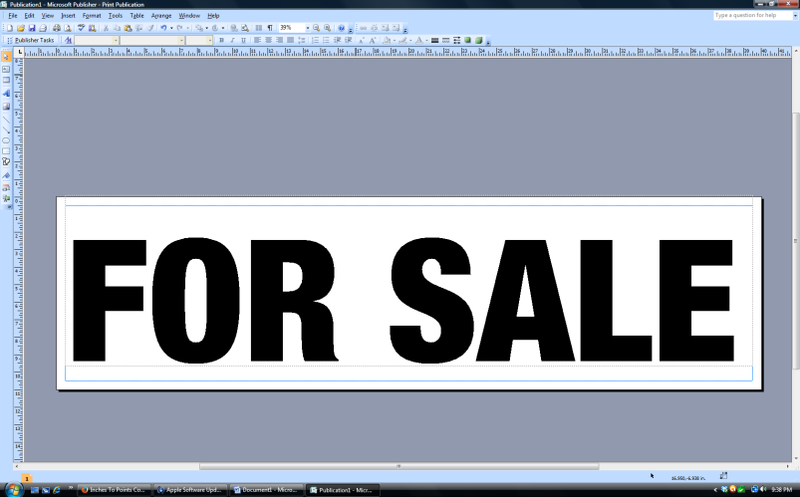 It is a good rule of thumb to only use one font, maybe two, but never more than three when you are designing anything. 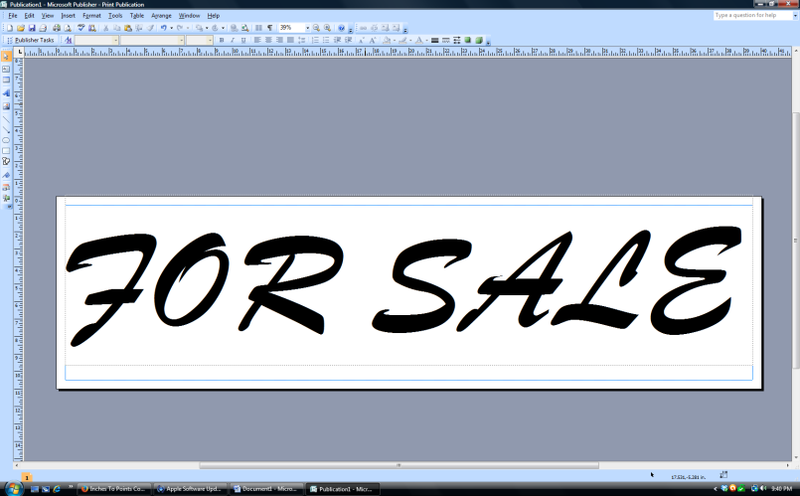 Here is a list of fonts with some common descriptive words that might help in font selection for banner design. Designer Tip: Do NOT use Comic Sans. It is unprofessional and should not be used in a business setting. It should only be used if you are creating a look for school children. The trick is to use a strong bold font that you can read from a distance. If you use thin fonts that are very “dainty,” your message will not be seen. Sign shops use charts that show how far away you can read text of a certain inch height. 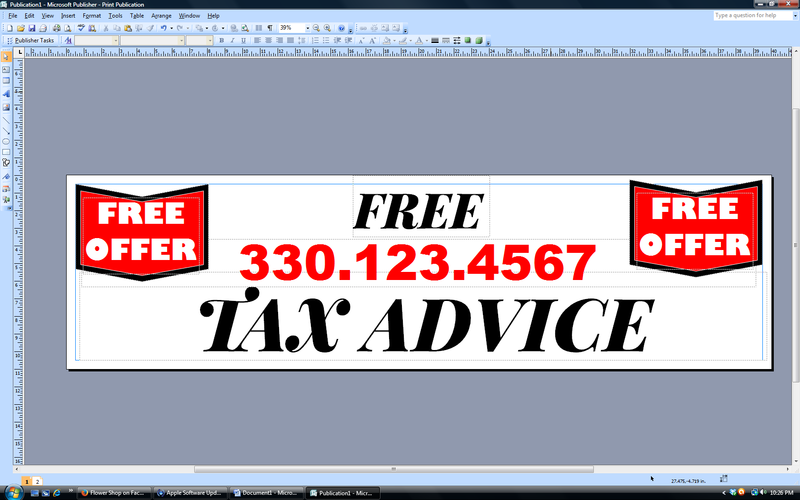 We are working with an 11″ x 40″ banner in this case. The letter height should not go over 10 inches (720 pt). Depending on the font you use, you will need to adjust this height because all fonts take up different amounts of space. Designer Tip: Learn to Kern. Kerning is the space in between letters and some fonts do not space them properly, especially in programs like Microsoft Publisher or Word. Choosing “Format” then “Character Spacing” from the menu will be your best friend, I promise. On to concept number two, color. Color is important. There is a reason why fast food restaurants use red, yellow and blue, just like coffee houses use greens, browns and neutral tones. There are color combinations that are meant to give you a headache and shut your eyes, just as there are color combinations designed to attract a certain type of person. After all of my years in the sign industry, red and white seem to be the most impactful and easily recognizable. Why you may ask? Those are the same colors as a stop sign. That object tells a driver to stop and pay attention. It is so ingrained into our minds that we do this with any other objects of the same colors. Yellow and black is also a great combination if you want someone to take warning, just like the signs that indicate a deer or a railroad crossing. On the other hand, you want to use colors that are appropriate for your message. If you are designing a banner for a little girl’s birthday, lots of pinks and purples would be appropriate, just as blues and greens are appropriate for a little boy. If you are going for a calming effect, muted colors should be used. Try Color Scheme Designer to help you visually apply some color to a space before choosing a color and hoping it is effective. Designer Tip: Use a reversal; they work wonders. For example, the white text on a red background used below. Last, but not least, let’s talk about a little thing called proximity. Proximity in design is the concept of keeping things together that need to be together, such as a name and phone number on a business card. People love to fill up the entire space available with as much information as possible, when the info is really not needed. Again, “Keep It Simple Silly.” If you are going to put more than one phrase on a banner, make sure it stays with the information it belongs with. 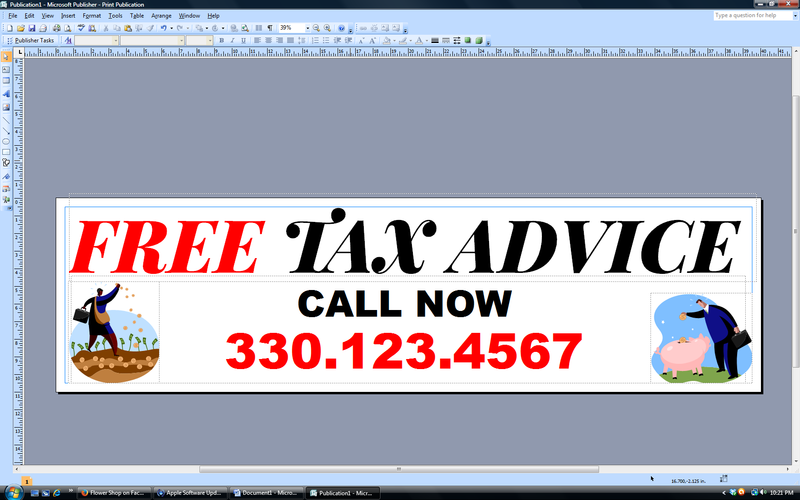 Designer Tip: Banners that have information displayed in a centered alignment tend to be read more easily. The banner above is poorly designed. There is too much information, it is scattered around the banner and the reader does not know what they are looking at, other than something is a free offer. It is bouncing out to them like a late-night infomercial. It is not easy to read or understand. I hope these little tidbits of information can help you on your journey to design the perfect banner to convey your message. Remember your K.I.S.S. principle, and you will create a great piece of signage. Happy creating! For a little further reading, check out the Non-Designer’s Design Book. It is a great little guide that will help you in any design situation. We hope you enjoyed Jenni’s design tips. You can find out more about her by visiting her on Facebook or JenniJamesDesign.com. https://copeco.com/wordpress/wp-content/uploads/logo.png 0 0 Denise Dennewitz https://copeco.com/wordpress/wp-content/uploads/logo.png Denise Dennewitz2016-03-26 14:33:042018-10-22 08:58:02So You Want to Design Your Own Banner?